Discerning musicians will be pleased to know that Profusion is now selling the latest NemFX reverb modules and single chips designed by revered audio engineer David Simpao. 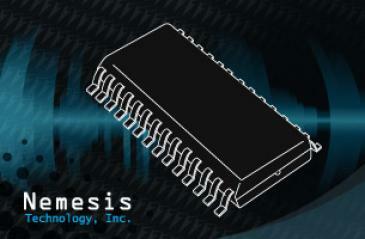 Nemesis has been supplying high performance digital effects modules and systems to the audio industry for over 17 years, and Simpao’s sophisticated and high performance DSP applications and optimised algorithms for guitar amplifiers and effects pedals are recognised by sound experts throughout the industry. Designed for applications where price is a driving factor, the NemFXSC-RDC is a Reverb, Delay & Chorus digital effects unit designed for entry-level products such as practice amplifiers. However, its superb sound quality and optional ‘External CODEC Mode’ enables the chip to also be used in more sophisticated applications. The NemFXSC-RDC has differential analogue audio input/output for easy mono in and stereo out operation, 6 reverb types (Plate, Room, Ambience, Hall and two different Spring), and requires only a +3.3V Power Supply. So its an excellent low cost option for a variety of demanding audio projects. The new NemFX Reverb 2 modules are arguably Simpao’s best sounding digital reverb modules yet, and come in a deceptively small and simple package that keeps things straightforward for the engineer and does not compromise on quality. The NemFX Reverb 2 is also pin compatible with the Accutronics Reverb Belton Brick, which is a digital replacement for their popular mechanical spring reverbs. Easy to use (analog in, analog out, +5V and ground), with AC-coupled inputs and outputs, 3 decay time options (Short, Medium and Long), and spring or room reverb, it is the perfect solution for audio projects large and small. So if you’re using the Belton Brick or a comparable module, consider getting a performance upgrade with the NemFX Reverb 2 ‘s superior sound quality and character. NemFX Reverb 2 modules are available in a number of sizes and in both horizontal and vertical PCB mounting. Please visit the Nemesis manufacturer page for further details on the models we stock.